is a book describing movement, touch and communication for pairs. Carefully illustrated using special photography, the book guides you with simple movements to help cope with physical ills such as back, neck, and shoulder pains, as well as muscle tensions arising from modern stresses. The movements are suitable for spousal, parent-child and sibling pairs and foster mutual understanding and moments of relaxation that reduce stress arising from life-changing events (such as a loss in the family), preparing for examinations, recitals, interviews, auditions and other daily pressures. The 1st edition of this book was published in 2001 and was the author’s first book. “I felt a special obligation to increase awareness about the important tasks of movement and touch in how we communicate and to our physiological development and overall well-being,” says Gilad Naaman, author of the MOVEMENTS IN TOUCH Book Series. 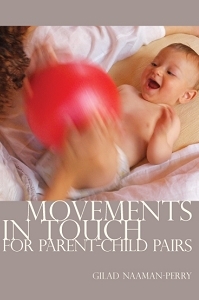 MOVEMENTS IN TOUCH FOR PARENT-CHILD PAIRS (3rd Edition) provides parents with a wide assortment of communicative techniques and bonding opportunities with their infants in the critical years that shape their development (curiosity, learning, experiences and pleasure), self-esteem and trust, through the use of the two basic survival elements – movement & touch. The book focuses on parent-baby bonding, personal well-being through individual activity (for adults), and deepening connections (for partners). The book was first published in 2005 and was inspired by the author’s personal experiences during his many years of child rearing his own two children. “The importance and challenges of incorporating communication, movement and touch is ever present, and is especially crucial in early childhood,” says Gilad Naaman, author of the MOVEMENTS IN TOUCH Book Series. 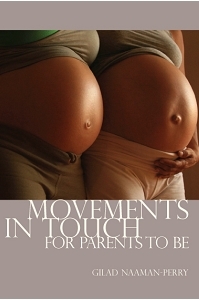 The book MOVEMENTS IN TOUCH FOR PARENTS TO BE is a book of movements designed to relax aches and pains brought on by pregnancy that are performed with one’s partner. It focuses on the familial bond of soon to be parents and their unborn child. Movement and touch set new opportunities for renewed connections, support and mutual understanding from which set the foundations for the healthy development of your newborn and for creating a nurturing and supportive environment for the whole family. 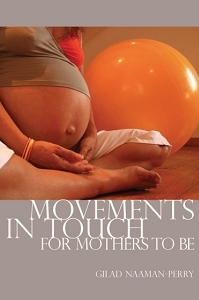 The book, MOVEMENTS IN TOUCH FOR MOTHERS TO BE, is a book of movements designed for pregnant women. It focuses on the special bond growing between a mother and her unborn child. Physical changes that occur during pregnancy often contribute to physical stress (especially to the lower back) and some mental strain that affects overall well being. Simple movements can alleviate physical stresses and provide mother-baby bonding opportunities that shape the nurturing instinct and sets the tone for a healthy mother-child relationship. 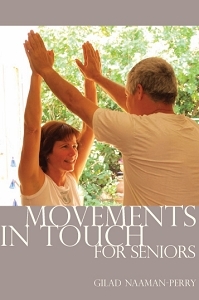 The book MOVEMENTS IN TOUCH IN FOR SENIORS focuses on special movements in pairs for people to enjoy as they get older. The movements are designed to open the chest area to encourage deep breathing, and help release and relax common physical discomforts brought on with age such as “dormant” joints by stimulating blood flow to reduce painful and confined movement. The simple movements described in the book do not require sophisticated devices, can be performed at your own pace, adapted to your schedule, and are suited to all age groups and couples (spousal, grandparent-grandchild, and friends, etc. ), and particularly to seniors.